The Soweto Uprising was a series of protests led by high school students in South Africa that began on the morning of 16 June 1976. Students from numerous Sowetan schools began to protest in the streets of Soweto in response to the introduction of Afrikaans as the medium of instruction in local schools. It is estimated that 20,000 students took part in the protests. They were met with fierce police brutality. The number of protesters killed by police is usually given as 176, but estimates of up to 700 have been made. In remembrance of these events, the 16th of June is now a public holiday in South Africa, named Youth Day. Black South African high school students in Soweto protested against the Afrikaans Medium Decree of 1974, which forced all black schools to use Afrikaans and English in a 50–50 mix as languages of instruction. The Regional Director of Bantu Education (Northern Transvaal Region), J.G. Erasmus, told Circuit Inspectors and Principals of Schools that from 1 January 1975, Afrikaans had to be used for mathematics, arithmetic, and social studies from standard five (7th grade), according to the Afrikaans Medium Decree; English would be the medium of instruction for general science and practical subjects (homecraft, needlework, woodwork, metalwork, art, agricultural science). Indigenous languages would only be used for religious instruction, music, and physical culture. The association of Afrikaans with apartheid prompted black South Africans to prefer English. Even the Bantustan regimes chose English and an indigenous African language as official languages. In addition, English was gaining prominence as the language most often used in commerce and industry. The 1974 decree was intended to forcibly reverse the decline of Afrikaans among black Africans. The Afrikaner-dominated government used the clause of the 1909 Union of South Africa Act that recognised only English and Dutch (the latter being replaced by Afrikaans in 1925) as official languages as the pretext to do so. While all schools had to provide instruction in both Afrikaans and English as languages, white South African students learned other subjects in their home language. Punt Janson, the Deputy Minister of Bantu Education at the time, was quoted as saying: "A Black man may be trained to work on a farm or in a factory. He may work for an employer who is either English-speaking or Afrikaans-speaking and the man who has to give him instructions may be either English-speaking or Afrikaans-speaking. Why should we now start quarrelling about the medium of instruction among the Black people as well? ... No, I have not consulted them and I am not going to consult them. I have consulted the Constitution of the Republic of South Africa …"
The decree was resented deeply by blacks, because Afrikaans was widely viewed—in the words of Desmond Tutu, bishop of Lesotho and later Dean of Johannesburg—as "the language of the oppressor". Teacher organisations, such as the African Teachers Association of South Africa, objected to the decree. A change in language of instruction forced the students to focus on understanding the language instead of the subject material. This made critical analysis of the content difficult and discouraged critical thinking. The resentment grew until 30 April 1976, when children at Orlando West Junior School in Soweto went on strike, refusing to go to school. Their rebellion then spread to many other schools in Soweto. Black South African students protested because they believed that they deserved to be treated and taught equally to white South Africans. A student from Morris Isaacson High School, Teboho "Tsietsi" Mashinini, proposed a meeting on 13 June 1976 to discuss what should be done. Students formed an Action Committee (later known as the Soweto Students' Representative Council), which organised a mass rally for 16 June, to make themselves heard. Hector Pieterson being carried by Mbuyisa Makhubo after being shot by South African police. His sister, Antoinette Sithole, runs beside them. Pieterson was rushed to a local clinic and declared dead on arrival. 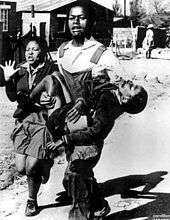 This photo by Sam Nzima became an icon of the Soweto uprising. On the morning of 16 June 1976, between 10,000 and 20,000 black students walked from their schools to Orlando Stadium for a rally to protest against having to learn through Afrikaans in school. Many students who later participated in the protest arrived at school that morning without prior knowledge of the protest, yet agreed to become involved. The protest was planned by the Soweto Students' Representative Council's (SSRC) Action Committee, with support from the wider Black Consciousness Movement. Teachers in Soweto also supported the march after the Action Committee emphasised good discipline and peaceful action. Tsietsi Mashinini led students from Morris Isaacson High School to join up with others who walked from Naledi High School. The students began the march only to find out that police had barricaded the road along their intended route. The leader of the action committee asked the crowd not to provoke the police and the march continued on another route, eventually ending up near Orlando High School. The crowd of between 3,000 and 10,000 students made their way towards the area of the school. Students sang and waved placards with slogans such as, "Down with Afrikaans", "Viva Azania" and "If we must do Afrikaans, Vorster must do Zulu". Among the first students to be shot dead were 15 year old Hastings Ndlovu and 13 year old Hector Pieterson, who were shot at Orlando West High School. The photographer Sam Nzima took a photograph of a dying Hector Pieterson as he was carried away by Mbuyisa Makhubo and accompanied by his sister, Antoinette Sithole. The photograph became the symbol of the Soweto uprising. The police attacks on the demonstrators continued and 23 people died on the first day in Soweto. Among them was Dr Melville Edelstein, who had devoted his life to social welfare among blacks. He was stoned to death by the mob and left with a sign around his neck proclaiming "Beware Afrikaners". The violence escalated, as bottle stores and beer halls—seen as outposts of the apartheid government—were targeted, as were the official outposts of the state. The violence abated by nightfall. Police vans and armoured vehicles patrolled the streets throughout the night. Emergency clinics were swamped with injured and bloody children. The police requested that the hospital provide a list of all victims with bullet wounds to prosecute them for rioting. The hospital administrator passed this request to the doctors, but the doctors refused to create the list. Doctors recorded bullet wounds as abscesses. The 1,500 heavily armed police officers deployed to Soweto on 17 June carried weapons including automatic rifles, stun guns, and carbines. They drove around in armoured vehicles with helicopters monitoring the area from the sky. The South African Army was also ordered on standby as a tactical measure to show military force. Crowd control methods used by South African police at the time included mainly dispersement techniques. The number of people who died is usually given as 176 with estimates up to 700. The original government figure claimed only 23 students were killed; the number of wounded was estimated to be over a thousand people. The aftermath of the uprising established the leading role of the ANC in the anti-apartheid struggle, as it was the body best able to channel and organise students seeking the end of apartheid. So, although the BCM's ideas had been important in creating the climate that gave the students the confidence to strike out, it was the ANC's non-racialism which came to dominate the discourse of the anti-apartheid movement amongst blacks. The perspectives set out in Joe Slovo's essay No Middle Road – written at just this time and predicting the apartheid government had only the choice between more repression and overthrow by the revolutionaries – were highly influential. The clashes also occurred at a time when the South African Government was being forced to "transform" apartheid in international eyes towards a more "benign" form. In October 1976, Transkei, the first Bantustan, was proclaimed "independent" by the South African Government. This attempt to showcase supposed South African "commitment" to self-determination backfired, however, when Transkei was internationally derided as a puppet state. For the state the uprising marked the most fundamental challenge yet to apartheid and the economic (see below) and political instability it caused was heightened by the strengthening international boycott. It was a further 14 years before Nelson Mandela was released, but at no point was the state able to restore the relative peace and social stability of the early 1970s as black resistance grew. Many white South African citizens were outraged at the government's actions in Soweto, and about 300 white students from the University of the Witwatersrand marched through Johannesburg's city centre in protest of the killing of children. Black workers went on strike as well and joined them as the campaign progressed. Riots also broke out in the black townships of other cities in South Africa. Student organisations directed the energy and anger of the youth toward political resistance. Students in Thembisa organised a successful and non-violent solidarity march, but a similar protest held in Kagiso led to police stopping a group of participants and forcing them to retreat, before killing at least five people while waiting for reinforcements. The violence only died down on 18 June. The University of Zululand's records and administration buildings were set ablaze, and 33 people died in incidents in Port Elizabeth in August. In Cape Town 92 people died between August and September. Most of the bloodshed had abated by the close of 1976, but by that time the death toll stood at more than 600. The continued clashes in Soweto caused economic instability. The South African rand devalued fast and the government was plunged into a crisis. The African National Congress printed and distributed leaflets with the slogan "Free Mandela, Hang Vorster", immediately linking the language issue to its revolutionary heritage and programme and helping establish its leading role (see Baruch Hirson's "Year of Fire, Year of Ash" for a discussion of the ANC's ability to channel and direct the popular anger). The United Nations Security Council passed Resolution 392 which strongly condemned the incident and the apartheid government. A week after the uprising began, Henry Kissinger, the United States Secretary of State, met the South African State President, B. J. Vorster in West Germany to discuss the situation in Rhodesia, but the Soweto uprising did not feature in their discussions. Kissinger and Vorster met again in Pretoria in September 1976, with students in Soweto and elsewhere protesting his visit, and being fired on by police. African National Congress (ANC) exiles called for international action and more economic sanctions against South Africa. Images of the riots spread all over the world, shocking millions. The photograph of Hector Pieterson's dead body, as captured by photojournalist Sam Nzima, caused outrage and brought down international condemnation on the Apartheid government. The Soweto riots are depicted in the 1987 film by director Richard Attenborough, Cry Freedom, and in the 1992 musical film Sarafina!. The riots also inspired the novel A Dry White Season by Andre Brink, and a 1989 movie of the same title. The Soweto uprising also featured in the 2003 film Stander about notorious bank robber and former police captain, Andre Stander. The lyrics of the song "Soweto Blues" by Hugh Masekela and Miriam Makeba describe the Soweto Uprising and the children's part in it. 20 years after the uprising, in June 1996, the Ulwazi Educational Radio Project of Johannesburg compiled an hour-long radio documentary portraying the events of 16 June entirely from the perspective of people living in Soweto at the time. Many of the students who planned or joined the uprising took part, as did other witnesses, including photographer Peter Magubane, reporter Sophie Tema, and Tim Wilson, the white doctor who pronounced Hector Pieterson dead in Baragwanath hospital. The programme was broadcast on SABC and on a number of local radio stations throughout South Africa. The following year, BBC Radio 4 and BBC World Service broadcast a revised version containing fresh interviews and entitled The Day Apartheid Died. The programme was runner-up at the 1998 European Community Humanitarian Office (ECHO) TV & Radio Awards and also at the 1998 Media Awards of the One World International Broadcasting Trust, and was highly commended at the 1998 Prix Italia radio awards. In May 1999, it was re-broadcast by BBC Radio 4 as The Death of Apartheid with a fresh introduction, providing added historical context for a British audience, by Anthony Sampson, former editor of Drum magazine and author of the authorised biography (1999) of Nelson Mandela. Sampson linked extracts from the BBC Sound Archive that charted the long struggle against apartheid from the Sharpeville massacre of 1960, through the riots of 1976 and the murder of Steve Biko, and right up to Mandela's release from prison in 1990 and the future president's speech in which he acknowledged the debt owed by all black South Africans to the students who gave their lives in Soweto on 16 June 1976. ↑ "The birth and death of apartheid". Retrieved 17 June 2002. 1 2 Harrison, David (1987). The White Tribe of Africa. ↑ "16 June 1976: 'This is our day'". 1 2 Sifiso Mxolisi Ndlovu. "The Soweto Uprising". The Road to Democracy in South Africa (PDF). 2. South African Democracy Education Trust. p. 327. Retrieved 30 October 2011. ↑ Alistair Boddy-Evans. "The Afrikaans Medium Decree". About. ↑ Sifiso Mxolisi Ndlovu. "The Soweto Uprising". The Road to Democracy in South Africa (PDF). 2. South African Democracy Education Trust. pp. 331–32. Retrieved 30 October 2011. ↑ The Youth Struggle, "The 1976 Students' Revolt". South African History Online. ↑ Sifiso Mxolisi Ndlovu. "The Soweto Uprising". The Road to Democracy in South Africa (PDF). 2. South African Democracy Education Trust. pp. 327–328. Retrieved 30 October 2011. 1 2 3 "The 1976 Students' Revolt". South African History Online. ↑ "The Soweto uprising 1976". socialistworld.net. ↑ F.I.J. van Rensburg. "Soweto, 1976: 'n Inklusiewe herbegin 30 jaar later?" (in Afrikaans). Die Vrye Afrikaan. ↑ "Policemen involved in June 16 Shootings have to Explain: Morobe". SAPA. 23 July 1996. Retrieved 8 February 2016. 1 2 Sifiso Mxolisi Ndlovu. "The Soweto Uprising". The Road to Democracy in South Africa (PDF). 2. South African Democracy Education Trust. p. 344. Retrieved 30 October 2011. ↑ Colin Martin Tatz; Peter Arnold; Gillian Heller (2007). Worlds apart: the re-migration of South African Jews. Rosenberg Publishing. p. 174. ISBN 978-1-877058-35-6. ↑ April Francis; Vanessa Marchese. "Apartheid South Africa and the Soweto Rebellion" (PDF). hofstra.edu. Hofstra University. ↑ "Resolution 392(1976) of 19 June 1976". Retrieved 16 June 2016. ↑ Mitchell, Nancy (2016). Jimmy Carter in Africa: Race and the Cold War. Stanford University Press. ↑ "Talks opened by Kissinger as riots flare". The Spokesman - Review. 18 September 1976. ↑ The producers of this documentary included Keketso Semoko, Jeffrey Molawa, Moferefere Lekorotsoana and Andrew Ntsele of Ulwazi, working together with Peter Griffiths of BBC Radio 4.